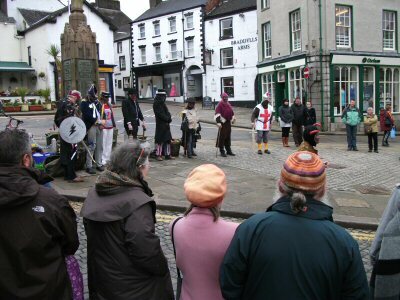 Easter Monday was the day for the Furness Morris Men’s Pace Egging play in southern Cumbria. The weather had been unkind in the first half of the morning with heavy rain, but it had stopped by the time I got to see them in Ulverston. 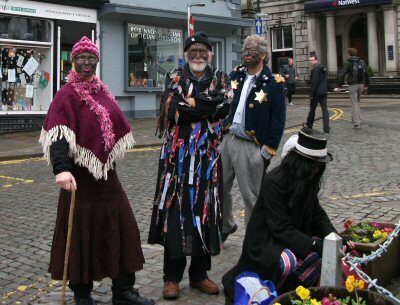 Furness Morris Men assemble to perform their Pace Egging play. 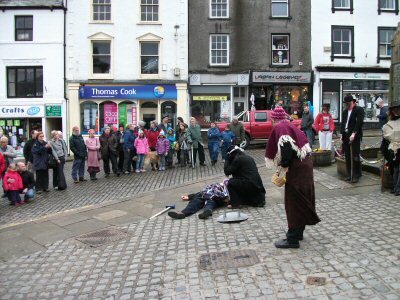 On arriving a quarter of an hour early, the Market Place was more or less empty, and I had visions of them performing to just a man and his dog - i.e. me and Rufus. However, come the magic hour of twelve o’clock, a good-sized audience had gathered below the war memorial (plus several more somewhat vocal dogs). Their play started with the Pace Egging song as they walked round the performance area. 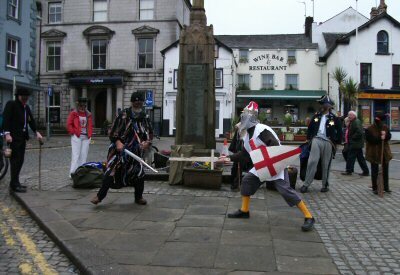 After a few introductions, a sword fight swiftly ensued between Saint George and the Prince of Paradise. Perhaps the Prince of Paradise might have won the bout if his wooden sword hadn’t split assunder in the fray. But then again, maybe not. On the advice of the audience, a distraught Betty Askett called for a doctor - one Doctor Brown - who, after being interviewed regarding his credentials, set about curing the fallen Prince. 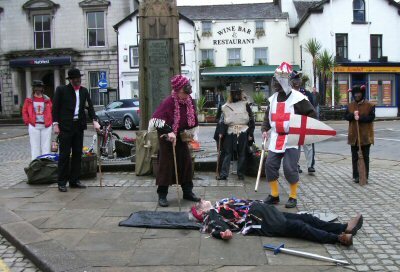 Thankfully, this was successful, and after the final song, the cast entertained the audience with several morris dances and a longsword dance. Lined up for the final song. As a footnote, this play felt like an old friend, because the first play I performed myself, as a schoolboy about 1967 and later with Nottingham’s Owd Oss Mummers, used the self same script - The Pasche Egging Play, compiled from several Furness versions by Stuart Lawrence and Bruce Wilson in 1965.